On 24 April 2015, nine militant groups of the northeast, including the NSCN (Khaplang) and the ULFA faction led by Paresh Baruah, have come together to form a new unified front during a meeting held recently in Myanmar, security sources said. According to Hindustan Times report, the move to form the “United National Liberation Front of West South East Asia” comes close on the heels of S.S. Khaplang, chairman of the NSCN (K), abrogating a 14-year-old ceasefire agreement with the Centre last month. Khaplang, a Hemi Naga from Myanmar, played a key role in organising the meeting of militant groups where the decision to form the new grouping was made, security sources told Hindustan Times. Though Khaplang will be the nominal head of the new grouping, a key role will be played by Paresh Baruah, the chief of the United Liberation Front of Asom-Independent who has consistently opposed peace talks with the Central government, the sources said. Nagaland Post states that both Khaplang and Baruah are currently based in Myanmar. Baruah moved to Myanmar after authorities in Bangladesh launched a crackdown on his group, the sources said. Besides the NSCN (K) and ULFA-Independent, other groups that participated in the meeting held at Taga in Sagaing division of Myanmar earlier this month were the Kangleipak Communist Party, Kanglei Yawol Kunna Lup, People’s Revolutionary Party of Kangleipak, People’s Liberation Army, United National Liberation Front and National Democratic Front of Bodoland (Songbijit faction). The new grouping is dominated by militant organisations from Manipur, which refer to the northeastern region as “West South East Asia”. Nagaland Post states that security sources said Chinese intelligence played an active role in encouraging the northeastern groups to come together on a common platform. Chinese intelligence operatives are active in the Sagaing region and weapons are often shipped to the northeastern groups through the China-Myanmar border. “The Chinese have promised to provide weapons and logistics to the new grouping as they want to keep things boiling in the northeast in view of their claim on the state of Arunachal Pradesh,” a source said. Earlier, the Chinese intelligence had played a role in bringing together several militant groups from the Manipur Valley in an umbrella organisation called CorCom. Most of these groups have now joined the new grouping. Several groups from the North Eastern states have training camps in Sagaing division. After the NSCN-Khaplang signed a truce with Myanmarese authorities in 2012, it has consolidated its position in the neighbouring country. The NSCN (K) split in late March after Khaplang abrogated the ceasefire signed with the Central government in 2001 and wound up the cease-fire supervisory board. The group had at the time accused the Central government of not being serious about discussing the issue of “sovereignty” for Nagas. Khaplang also expelled two of its kilonsers- Wangtin Naga and P. Tikhak from the group, who were in favour of extending the ceasefire pact with the Government of India. 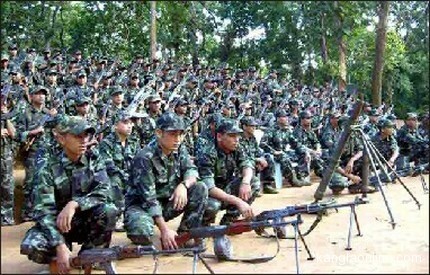 Following the expulsion, Wangtin and Tikhak formed a new group under the name NSCN (Reformation) Nagaland Post states.